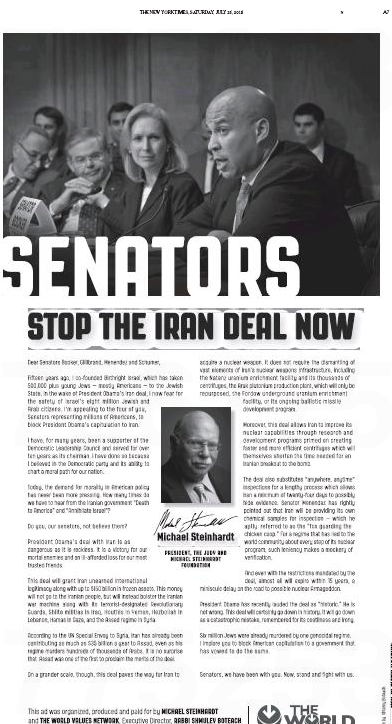 Yesterday’s New York Times featured yet another ad from Zionista Michael Steinhardt, whose previous Times ad (along with his various associations – see here and here) we dutifully noted last month. This time around, Steinhardt has teamed up with Rabbi Shmuley Boteach of The World Values Network. We’re not sure what that means, but we’re sure it means something. This entry was posted in Uncategorized and tagged Birthright Israel, Chuck Schumer, Core Booker, Israel, John Stossel, Judy and Michael Steinhardt Foundation, Ken Abramowitz, Kirsten Gillibrand, Michael Steinhardt, New York Times, NYU's Steinhardt School of Culture Education and Human Development, Palestinian Authority, Rabbi Shmuley Boteach, Rand Paul, Robert Menendez, Samantha Power, Sheldon Adelson, The World Values Network, United Nations, Warren Buffett. Bookmark the permalink.